Who said church wasn’t fun. 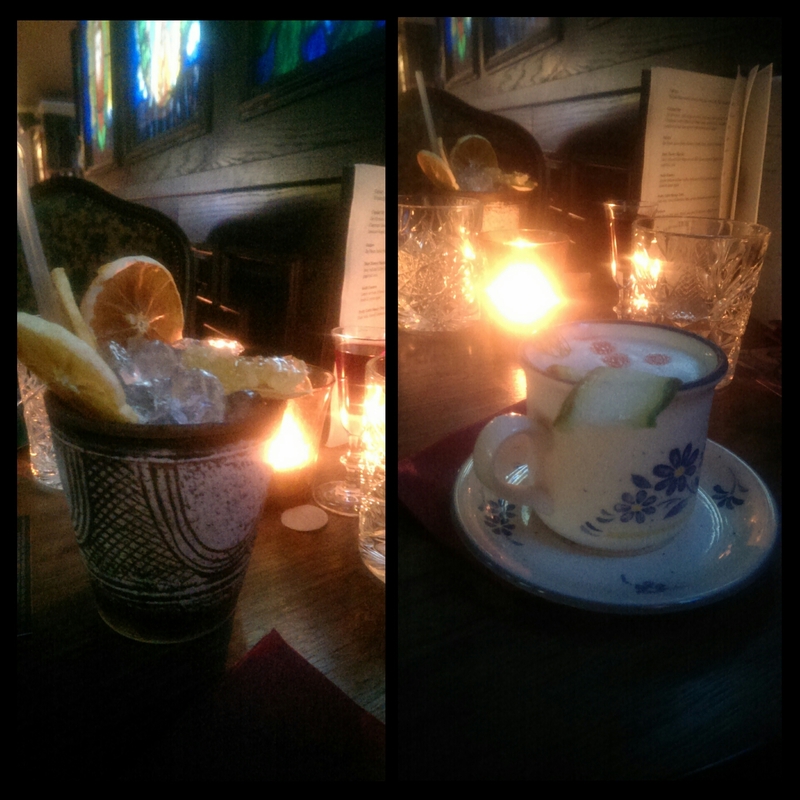 This gem tucked away under Church St Hotel in Camberwell is a welcome addition to London’s bar retinue as of December. In fact, this is one of my longer reviews, going through so much of the menu – primarily because many of London’s cocktails bars seem to have forgotten that Happy Hour does not instantly make your bar a Yates. 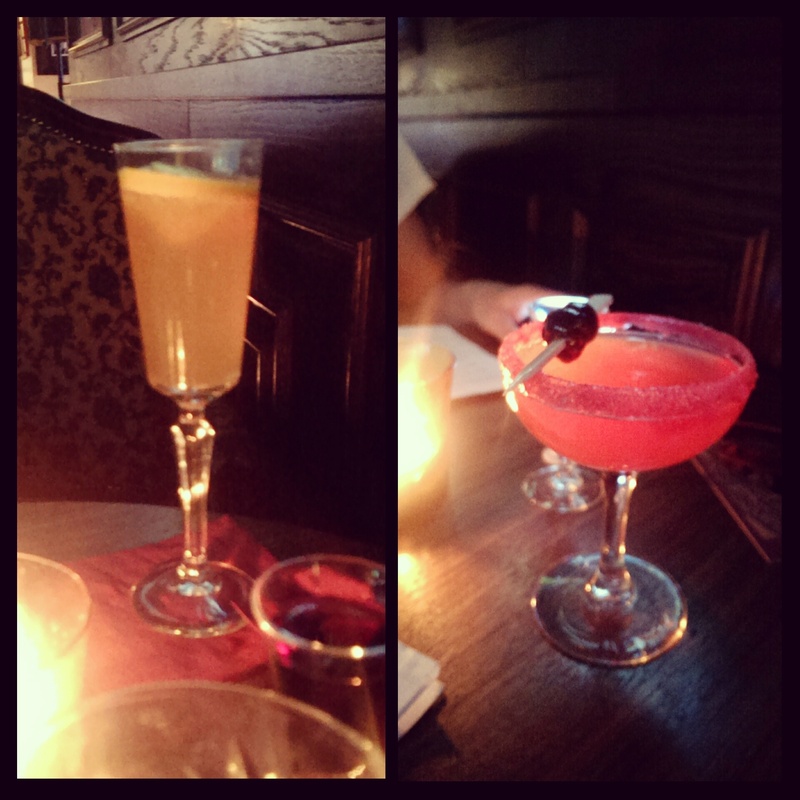 In fact, it is the perfect time for intimate drinks and snacks at Communion, with a wonderful cocktail list. For one, can we talk about this design for a second? Coming through the heavy wood and metal-hinged door into the depths of the hotel’s basement, stained glass windows adorn the hardwood panelling, depicting various scenes from the Bible, primarily Genesis and Revelations – among them the Hoodooist’s favourite Biblical scene: The Worship of the Golden Calf, sprawling on the wall across from the bar. 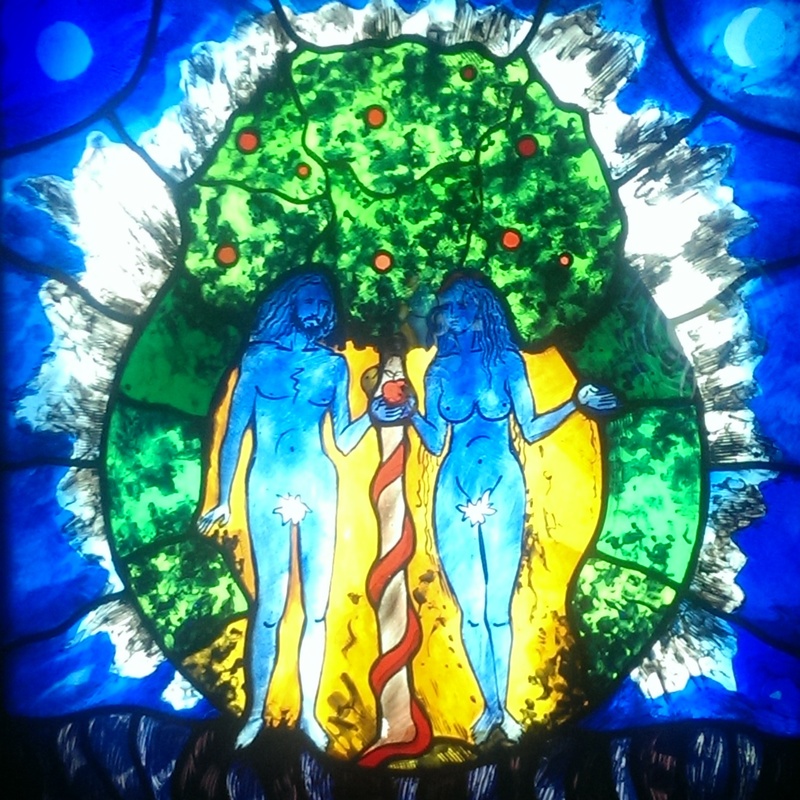 There is a slightly infernal and deliciously sacrilegious feel about Communion – peculiarly macabre stained glass scenes in a dark, basement venue are paired with upbeat Soul and Funk tunes, and on weekends, live bands of the same genres. You’ll notice no bar stools to make the most of the space to dance to the live bands. Taking our seat, we notice that each table comes with communion wafers and a beautiful little shot of red wine, poured daily. I gave it a moment’s thought – what I love about the atmosphere here is that it has a strong theme, without it becoming gimmicky by overwhelming you with introductions, stories, character bartenders/servers – or having to come up with a film noir story to get in (*ahem*). The mini-Eucharist was all that was necessary, and the most it should do, to keep the theme without over-doing it. Just about right. Looking at the menu, it is longer than at first glance – and incredibly varied. The theme of the first page is that each drink is dedicated to the different cultures that define the bricolage of South London’s landscape. Our first drink, the sweet Tannery (Vodka, Araku rum coffee liqueur, Nigerian Guiness foam and chilly chocolate) is an excellent espresso-less Espresso Martini. The coffee flavour of the Araku and the head of Nigerian Guiness dishes it out adequately, and the edible chocolate rim that you can nibble away at throughout the drink is a great perk – a perfect balance of coffee and chocolate. The Dry Cherry Ilegal (Ilegal Mezcal, juice of grilled Sicilian lemons, Cherry Marnier and bitters. Served straight up with Amarena Cherry sugar rim) comes with one of my favourite mezcals, whose light smokiness carries the initial citrus of the drink, which opens up on the cherry and the intense sweetness of the sugar rim. Don’t let that fool you into thinking the drink is overwhelmingly sweet, it certainly isn’t – the Sicilian lemon’s tartness mediates it well. Could use a teensy bit more mezcal. The Ortanique Grind & Bubble (L); and Dry Cherry Ilegal (R). The Pretty Little Shanty Town (Dark rum, Velvet Falernum, lime, ginger, orange bitters & molasses) begins strongly with ginger and Falernum’s spiciness, ending on the sweetness of the rum and rounded off with the molasses. The garnish of this drink is more the star, with orange slices dried in situ, and irresistible Spanish honeycomb. The Ortanique Grind & Bubble (dash of Punt E Mes, Vanilla & orange flower infused Stolichnaya, home-made limoncello, fresh Jamaican Ortanique & Prosecco) is a wonderfully fresh and lively drink. The prosecco is, like in all bubbly drinks, the most demanding flavour, but otherwise, the drink opens on the Ortanique and limoncello, leading into the strong Punt e Mes. The Orange flower is somewhat detectable, but I had trouble finding the vanilla. Less balanced drinks: The Calvary’s (Dicatador Rum, morello cherry, lime, egg white, St John Commandaria wine) sweet wine unfortunately has a tendency to drown out the flavour of the rum, though the morello cherry does eventually take charge – a decent drink, but less so compared to the previous ones. Similarly, the Fresh & Loose’s Scandinavian twist (Beefeater 24 shaken with fresh cucumber, dill, fennel, citrus and egg white, with couple dashes of Peychaud’s bitters) was dominated by cucumber and citrus, with flashes of dill – but still a well crisp drink. The one drink I was not impressed by was the Outlaw (Jim Beam, home-made cranberry syrup, mint, sugar & chocolate bitters), which was drowned out by the strength of the mint. The Pretty Little Shanty Town (L); and Fresh & Loose (R). WHEW. This’ll take up a whole Sunday. Service through all this was absolutely delightful, attentive, and conversational – we couldn’t have asked for a better hostess. Bartenders were quick and on the ball with their home-made ingredients – there is real talent here. 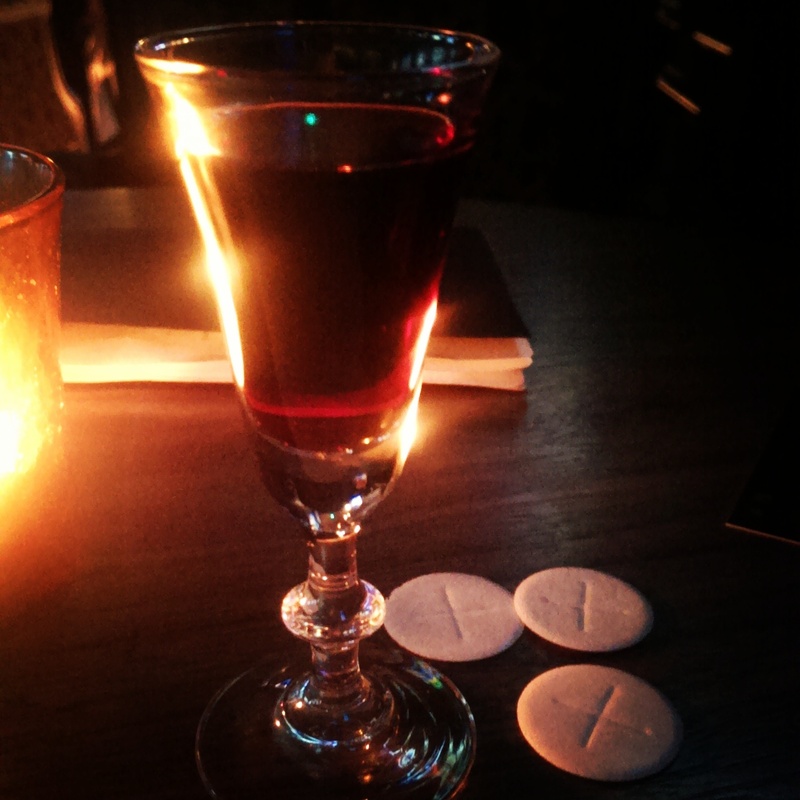 Really falling for Communion, I almost don’t want to tell you about it. A bit out of the way to get to, but worth the travel; Communion Bar is a rare cocktail bar in the area, and certainly sets the bar high. The Hoodooist looks forward to returning. This entry was posted in Bars & Cocktails and tagged Basement, Camberwell, Date, Hotel, Large Groups, Live Music, Quirky, Small Groups, Theme.